The opportunity to participate in a great live performance of Götterdämmerung is a rare privilege. Given the massive artistic enterprise that is the Ring, it is rare for one to simultaneously encounter singers, dramatists, instrumentalists, conductors and directors of the highest caliber. And I count myself as privileged to have witnessed one such Götterdämmerung at the Royal Opera House during this season’s revival of Keith Warner’s Ring. Although Wagner’s Götterdämmerung is the drama furthest removed from the saga’s divine origins, it is also the opera that acquires the Ring’s most profound mythological dimension. The tetralogy’s narrative has always been deeply human, but I find that it is in this post-supernatural world that Wagner’s characters most strongly parallel the numinous transformations of mythical heroes. Wotan’s tremendously composed character arc aside, no other opera in the Ringpresents as compelling or transcendent a hero as the mature Brünnhilde or as malevolent and existentially threatening a villain as Hagen. Warner’s vision presents the most optimal synthesis of directorial ideas and production design in his entire cycle. I qualify this as optimal because a few stage and dramaturgic devices that Warner employed in the previous operas could be conceptually inconsistent. Others appear superfluous or half-baked (Freia’s flirting with Fasolt, the division of the set to a three-part stage in WalküreAct 1). On completing this survey of the Ring, I concluded that Warner and set designer Stefanos Lazaridis’ Regie overall show an intimate understanding of Wagner’s music and libretto. What prevents this production from attaining the legendary status of truly great Rings like those by Chereau or Kupfer is the absence of a unifying aesthetic that is impressed distinctively from the prologue to recapitulation. Warner observes and portrays effectively the presence of hierarchies of power in the Ring—Nibelungs are awkward and lovelorn technologists, the Aesir are effete and ineffective nobles bound by social codes, and giants represent the working class (Fasolt) and their oppressive masters (Fafner). The saga’s demigod mavericks and heroines expectedly free themselves from the strictures of their hierarchical confines, but this approach is already familiar to us from previous and more thoughtfully crafted incarnations of the saga. This Ring also abounds in symbols that are begging to be decoded (e.g. a hydraulic wall is a repeated presence, and the model plane that fascinates Wotan and Loge in Rheingold becomes a main fixture of the stage in Act 1 of Siegfried), but their significance as narrative devices sometimes remains unclear. The most notable example that comes to mind are a mess of quantum mechanical and thermodynamic equations that recur throughout the cycle (displayed in the scenes that feature the Nibelungs and the Norns—perhaps Warner’s way of describing beings that are privy to the mysteries of creation). Though moments in this Ring can be clever, much of the production ultimately feels incidental. Despite this, my reaction to the production’s totality remains positive due to the dramatic acuity of the stage direction and Antonio Pappano’s talented cast. At the end of the day, when the artists and musicians are wonderful, Wagner’s art wins. Most of this production’s inconsistencies are gratefully absent from Götterdämmerung. The main theatrical concept that pervades the sets and dramaturgy seemed concerned with depicting the corruption of creation through greed and power as symbolized by the Tarnhelm, a gridded box. After Siegfried sets off on his Rhine journey, the austere vestiges of the mythical realm transform into a modernist palatial setting flanked by walls that resemble the Tarnhelm—this is probably my favorite set piece, as it ties in a symbol of transformation and corruption with a world that has become divorced from creation’s purity. And it is this Tarnhelm-inspired set that establishes the tone for much of the opera. When we return to Brünnhilde’s rock at the end of Act 1, her rocky abode is now flanked by these walls. In Act 2, we return to the palace of the Gibichungs, here studded with grand, golden statues of the Norse gods—once the drivers of destiny, here nothing but hollow symbols of a decaying order. Act 3 is set in a sere and blackened bank of the Rhine. Here, relics that symbolize characters who have succumbed to the Ring’s curse are laid out in the proscenium and used as devices in Siegfried’s final exposition. Although the last act’s stage design contains elements of inspiration, its execution feels less unified than the first two. As the opera draws to a close during its fiery denouement, the entirety of the fabricated world that was corrupted by the Ring’s curse is consumed in flames. Nature is shown as being returned to its original state as the Rhinemaidens undress and reunite with their golden ring. From atop the stage a half ring piece descends, carrying above it the everyman who will inherit this purified world. Pappano’s musical direction also reached its apex in the Ring’s final installment. The prologue and the first scene of Act 1 were not particularly distinguished in color, dynamic and blending compared with the scenes and acts that followed. However, from Waltraute’s scene onward, Pappano drove the orchestra in a taut and exciting reading, the strings and woodwinds coloring their phrases beautifully to suit the current mood of the drama. As in the previous operas, the ROH orchestra’s brass section was problematic, at times failing to smoothly transition between passages, and during others producing an insipid sound. The most jarring brass blips occurred in the prologue and the beginning of Act 3—the horns’ entrance at the beginning of the prologue was out of sync, the trumpet solo immediately before the rope snaps was wildly out of tune, and the Siegfried brass motif that begins Act 3 was simply embarrassing—the latter prompting audible gasps from the very polite ROH audience. Outside of this, the rest of Götterdämmerung’s orchestral performance was driven and engrossing. I especially enjoyed the characterful, almost sinister string and woodwind tone in Hagen’s watch, and was captivated by the sympathetic and tragic mood elicited by the orchestra from Siegfried’s death onward. The Immolation scene provided catharsis to this listener, as it should for any great performance of the last Ring opera. But the main reason that the 2018 edition of Warner’s Ring was as powerful of an experience as it was lay at the feet of the cast who relived the characters of Wagner’s saga. On surveying the roster of singers from Rheingold to Götterdämmerung, one noticed that great care was taken to ensure that doubling rarely occurred between various roles. This meant that different singers were assigned to mezzo roles like Fricka, Waltraute, and Norn 2, and bass roles like Fasolt, Fafner, Hunding and Hagen. The Rhinemaidens never reappeared as Valkyries, and Donner and Gunther were each assigned to different baritones. Most of the singers here are either distinguished Wagnerians or those who will look likely to emerge as major interpreters of these dramatic roles. Very rarely can one encounter a cast of this variety and caliber in the theater, and it is a marvel that Pappano was able to secure such accomplished vocalists for nearly all the Ring’s roles. Of the Norns who began recounting the story of the Ring, it is Lise Davidsen who created the most impact with her powerful dramatic soprano. Davidsen formerly played Freia and Ortlinde in the cycle, and while her Valkyrie’s clarion cries rang truest among the octet of warrior maidens, it is her Third Norn that confirms her place as this generation’s dramatic soprano of promise. Wielding a luxurious columnar sound of noble and warm colorings, the artist augured the coming of the end with an urgency that was amplified by her overwhelming ascents to the top. I also appreciate that she uses her stature to her advantage, both as Ortlinde and the Third Norn. Despite the brevity of her parts, her dramatic acumen promises great things for the day when she chooses to undertake the roles of Isolde and Brünnhilde. Lauren Fagan, the young soprano who plays Woglinde in Rheingoldand Götterdämmerung, is another young singer worthy of mention. Though the three Rhinemaidens in this production produced mellifluous and well blended phrases, Fagan distinguished herself most strongly in her brief appearances with her brilliant vocalism and her athletic stage presence. Karen Cargill, a Scottish mezzo soprano whose work I know through her solo work in Mahler’s symphonies, was an outstanding Waltraute, combining a wide palette of colors and an instrument of such arresting richness and depth. Her narration of the world’s impending doom was imbued with such tension and abandon, reminding me of the anecdote about Wieland’s direction to his Waltraute to act as if she had just escaped from Hitler’s bunker with the secret of saving the world. Gutrune and Gunther in this opera are assumed by Emily Magee and Markus Butter. I found Magee’s mid-strength and angular dramatic voice better suited to Gutrune than Sieglinde. The phrases seem to lay more comfortably with her natural range, and much of her music is properly sung as opposed to declaimed as Magee did in Walküre. The soprano also plays Gutrune as a sorceress of cunning as opposed to the sweet, innocent thing we are accustomed to hearing on record—a positive for this listener, especially as the nature of the character couldn’t be further from the vocal composition of a sweet lyric voice. In this opera, Butter wielded a Mozartean sound trying to masquerade as a Wagnerian baritone. His voice wavered under pressure during the ensemble pieces in Acts 1 and 2, and while his aristocratic bearing meshed well with Warner’s concept of the character, I would have preferred a Burgundian king who could hold his own against Hagen. I found his instrument especially wanting in the heated passages of Act 2, where Stemme’s Valkyrie easily overpowered him during the ensemble writing. Some of the stage direction given to the Gibichungs came off as strange—Gunther appeared have a quasi-sexual rapport with his sister in some scenes of act 1, but that notion was never revisited in the opera. One welcome stage direction had Butter entering Brünnhilde’s rock as opposed to a helmeted Siegfried, here directed to sing the lines from the proscenium. Stephen Milling, the Danish bass who played Hagen in this opera, gave one of the evening’s standout vocal performances. Milling has over the last decade established himself as a Wagnerian of repute in European theaters. His basso profundo was generous in vocal amplitude and replete with nuance and color. Where most basses portray Hagen as a brutal villain, Milling’s reading of the role is that of a Machiavellian puppet master who manipulates his kin and the drama’s main players into accomplishing his will. Milling’s layers of interpretation were revealed over the course of the opera, his development here nearly equaling Brünnhilde’s arc in scope and range. His soliloquy at the end of Act 1 gives audiences a glimpse of the master manipulator we would witness in full flower at the end of the tetralogy’s final two acts. During the beginning of Act 2, his interactions with a moribund Alberich (Johannes Martin Kränzle’s finest moment in the entire cycle) showed audiences a more sympathetic and tormented Hagen whose attempt at escaping his father’s oppressive shadow proceeded tragically with his own self’s corruption. One of the creative liberties that Warner took with Hagen’s character struck me as genius stage direction. At the end of his scene 1 soliloquy, Hagen moves to a chair placed at the far-right end of the proscenium. From that point until the end of his second act watch, Hagen would play the role of observer and driver of fate—something I thought rather inspired since the character we know from the libretto is deeply familiar with the events of the saga. Stefan Vinke reprised his Siegfried from the last opera. As I had previously mentioned, his Siegfried for me can either be a phenomenon of heldentenor singing or a grating experience depending on the range of the vocal writing. When the line ascends to the top half of his tenor, Vinke’s voice is simply spectacular. But the Götterdämmerung hero is a very different animal from the boisterous teenager we encountered in Siegfried. Much of his music in Act 1 moves in a heroic parlando, written more in the middle to low range as opposed to the brilliant showstopper that dominated much of the last opera. Hence, the Siegfried of the first act came off as more stentorian, with Vinke’s voice giving off an idiosyncratic bleat. Fortunately, the latter two acts found Vinke in superior voice. In the ensemble exchanges with Brünnhilde and the Gibichungs, Vinke’s voice cut valiantly above the welter of sound and established his dominance in the drama. In for the third Act, the bleat disappeared, allowing Vinke to summon the much-needed poetry to end his character’s story. The recapitulation of his life was executed with lyricism, and I found his death incredibly moving and beautiful—if the singing here defined the rest of Siegfried’s music, I wouldn’t have hesitated to rank him among the great interpreters of the role. I should mention that his high C in Act 3 was surely the most spectacular and longest high note I have heard from any heldentenor live. I’d like to end my reflection on Warner’s Götterdämmerungwith my assessment of Nina Stemme’s Brünnhilde, as her reputation and artistry inspired this trip to experience my first Ringcycle. I’ve followed this great artist’s career since I was first introduced to her spellbinding Isolde from Pappano’s studio recording. 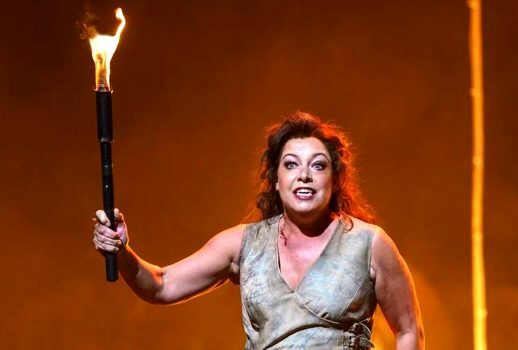 Given her age, I came into this production acknowledging that her voice may have lost the shine of her younger years, and that this round of Brünnhilde’s could very well be one of her last traversals of the role. Many of those concerns, however, were dispelled when I experienced her evolution as Brünnhilde in this Ring. Nearly 15 years after her forays into the hochdramatische repertory, Stemme’s voice has expanded with an earth-toned, Erda-like richness throughout her middle and bottom range. Her top has also gained in power and thrust, with only the very highest of notes acquiring an occasional edginess. Still there is the diamantine brilliance and the feminine warmth that drew me to her artistry, the remarkably kaleidoscopic palette of her vocal inflections, and the textual precision of her phrasing and diction. Interacting with her in the theater proved even more fulfilling artistically, as she channels her deep identification with the role not only through her vocalism, but also through her keenly attuned facial expressions and body language. Stemme’s Brünnhilde for me is the most human that I’d experienced from records and in the theater. The multifaceted complexity of her heroines in Walküre and Siegfried exude a compelling admixture of wisdom, pride and nobility that is reflected in her interactions with Wotan and the Wälsungs. Her Todesverkundingscene with Stuart Skelton and her pleas to Wotan remain etched into my memory as some of the most transformative scenes of Wagnerian theater. While the SiegfriedBrünnhilde’s higher tessitura can challenge her in the most exposed passages, Brünnhilde’s evolution from divine to human is so convincingly portrayed and lyrically sung that one can forgive the edgy high C.
Ultimately, it is Stemme’s GötterdämmerungBrünnhilde that stands out as the supreme artistic creation of this Ring. Although our favorite valkyrie undergoes an evolution over three operas, her journey in the final drama encapsulates a microcosm of a divine hero’s transformative arc. In her final take on the character, Stemme through her spectacular vocalism and consummate characterization completely embodies Brünnhilde’s return from mortality to godhood. While her vocal performance in the prologue was not her strongest suit (she had not yet fully warmed up), her duet with Vinke is impassioned and brimming with radiance and human vulnerability. By the time Waltraute arrives at her rock, her soprano had further steadied and taken on a fuller, more cavernous dimension. Her scene with Cargill, sympathetic and wistful at the beginning and proudly defiant upon rejecting her pleas, electrified the house during this exciting exchange of dramatic voices. The violent scene that followed was equally arresting, with Stemme portraying Brünnhilde’s fall from grace with such pathos and resignation. Act 2 was even better. The soprano’s forays into Elektra and Kundry have served Stemme’s instrument well, imparting to it a cutting, dramatic thrust ideal for expressing a tragedian’s searing rage. I was overwhelmed during her oath on Hagen’s spear, where she vocally and physically subjugated Milling’s imposing Hagen. Unforgettable too are the moments leading up to the revenge trio, where Brünnhilde upbraids the Gibichung men with her titanic fury and brings into perspective what makes Wotan’s favorite daughter such a dangerous creature. If this performance of Act 2 were the only Wagner that survived of Stemme’s legacy, it would still cement her position as one of the great dramatic sopranos and tragedians of recorded history. Finally, Stemme achieves apotheosis with Brünnhilde’s closing soliloquy and convinces the listener why she is the divine incarnation of Wotan’s will and Erda’s wisdom. That intimate phrase, “Ruhe, ruhe du Gott,” catches one’s soul as she impregnates it with all the gravitas of having to purify creation of the Ring’s curse. On ending her rapturous Immolation Scene, Stemme’s Brünnhilde ascends once more to the plane of the divine and brings the saga’s story to a close. The Warner Ring reminded me how the power of great singing and theatrical artistry can rescue an opera from the mess of ambiguity. Although I am still trying to decode the meaning behind this production’s mishmash of symbols, I realized that Wagner’s parable of redemption and love still emerged in all its musical and dramatic grandeur from these disparate elements. At the end of the cycle, Wagner’s art won, and by experiencing it I too am forever changed.